This has not been a good week for me and Dear Diabetes. In the last five days I have had 55-60 total units of insulin shooting through my body. Of that, 30 units is continuos basal. To put it into perspective, normally I average 17-21 total daily units of which 12 is basal. Right now, I am triple dosing. Yet, my blood sugars are high. Abnormally, dangerously high, unable to crack below 13 mmol most of those days. Generally, I am rarely above 10.0 mmol. This photo was compiled late Friday afternoon. By end of day, my total daily dose was at 57 units. The culprit: a cortisone injection in my right hip joint that was administered Thursday morning to counter the effects of a labrel tear. Apparently it is well known in the medical field that cortisone (and other steroids for that matter) can often wreak havoc on diabetes management. Yet, I was never made aware. Not from the surgeon who booked the appointment. Not from the nurse who prepped me for the cortisone. Not from the doctor who administered the injection. They all knew I had Type-1 diabetes and that I was on an insulin pump. When I met with the surgeon, our initial conversation was about surgery, and I flat out asked how surgery would affect my diabetes. He told me, minimally. When it was decided a cortisone shot would be the best course of action, I did not ask about my diabetes. Maybe that was my fault, but given that I had asked about it for the surgery side of things, you would think, if it was an issue, the surgeon would have notified me. In the exam room, I asked the nurse if I should remove my insulin pump. She said no. She did not tell me the insulin would essentially be like water going through me following the injection. When the physician came in and informed me of the procedure and the effect the cortisone may have on my joint, and the small chance of infection, he said not a word of my diabetes. He had every opportunity. I had to move my insulin pump out of the way. When the procedure was done, I got tangled in my insulin pump wiring and he helped untangle me. Thursday night my blood sugars had crept up to 13.7 mmol. after dinner. It was a burger dinner, and I thought maybe the ketchup or bun had an effect. By the morning, they were at 16.4 mmol. I thought my infusion was faulty, maybe there was an air bubble in the line, or the canula had bent. I switched it out. Two hours later, they were at 16.9 mmol. I do not do high blood sugars. I rarely have them. I do not know what to do. I raged bolus. I increased my basal by 100%. 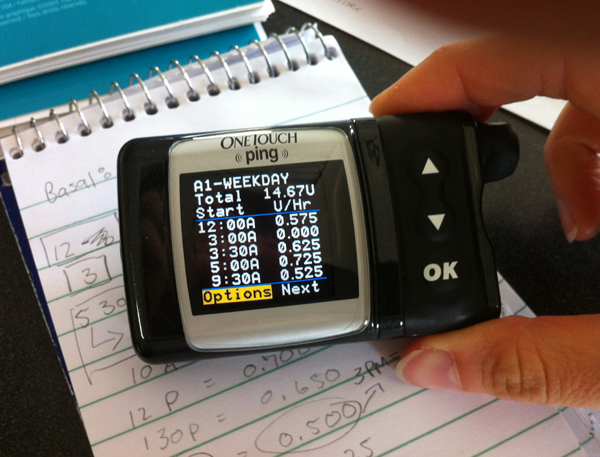 I ran the insulin through the line, checking that it was actually going through. I questioned every dose I had administered. I re-reviewed everything I had eaten. I switched out the old insulin, for a new, in-the-fridge bottle. By dinner, I was near tears. I had no idea what was going on with me. I was worried about ketones. I was worried about the incessant itching of my legs, so bad I drew blood. I was worried about my perfect hemoglobin A1c. Big Ring asked if the cortisone could have had an effect. My fingers swiftly tapped over the Google keys and sure enough it was there. Cortisone is a beast for diabetes. Are you effing kidding me? Why did know one, not one of those doctors, inform me? Why? I posted on Facebook asking all my T-1 peeps for advice on how to deal. So many suggestions. So many expressions of shock that I was not notified ahead of time. My basal has been set at a continuous +200%, which is the maximum basal dose for Animas pumps, for days; if it could go higher, it would. I’ve been testing my blood sugars every two hours, and at nearly every test, I’m doing bolus corrections. Since getting the cortisone, I have dosed, both by pump and syringes, 235 total units. I go hours without eating. I fear food, and the effect it will have on my blood sugars. I’ve cracked the extreme highs for the most part, now sitting between 8.0 and 10.0 mmols, but that’s still with the crazy increase in insulin. I feel sick inside. I feel lethargic, winded. Even talking is an effort. I don’t know when it will come down. I don’t know when I will feel better. But I do know, every step of the way, I was failed by the medical system. I’m what some might call a quasi lazy diabetic. Despite the fact I am OCD when it comes to obtaining BG perfection with my blood sugars, testing, on average, at least 12 or more times a day, I’ve been known to let the ball drop when it comes to physically recording my blood sugars, and for that matter, my insulin doses. For years I relied on the memory of my machines, only bringing them out on the hour drive to my endocrinologist’s office, frantically jotting a month’s worth of readings down while my moms drove the car. And when I got the pump, I’d make changes to my doses on the pump, but I never kept a file of what those doses were. If the pump was ever to crap out and revert back to factory settings, like it did recently, I would have had nothing to fall back on. My memory is nowhere near strong enough to remember 8 different doses plus 5 or more insulin-to-carb ratios throughout the day. Ahh, but my world of diabetes changed thanks to technology. No longer do I frantically scribble out my blood sugars the day of appointments, not when I’ve got a plug from my metre to computer downloading them all in about a minute. And my insulin doses, oh man, this is brilliant – hello iPhone – hello pocket camera – hello snap-snap. Forever documented in less than a second! So yeah, when my pump totally crapped out the other day, and my settings went blank, I was not freaking out. Nope. I’d just made a few changes to the settings a couple days prior, of which I permanently stamped into my iPhone’s camera roll.